Our SECURE online donations are processed by GivingFuel. You can be confident that the highest level of security is protecting your information. All information is encrypted, and YFC does not have access to your credit card number, checking account number or bank routing number. Please fill out the form completely and then click "Donate Now" at the bottom of the page. Please consider signing up for monthly donations from your checking account or credit card. Just choose "Monthly" in the "Recurring" section of the form. Doing so will establish an automatic monthly withdrawal from your checking account or credit card. Your donation will be processed on the same date each month. For example, if today is the 5th of the month, your recurring monthly donation will be processed on the 5th of each future month. If you chose quarterly or annually, your next donation will be processed on the same date of the corresponding month. You can choose the exact date to have your recurring donation processed each month by clicking the "Start my gift today" option. You may also choose: "Single Gift," "Quarterly Gift" or "Annual gift." Choosing "Quarterly Gift" or "Annual Gift" will also establish an automatic withdrawal on the date you indicate. You can cancel automatic withdrawal at any time by emailing [email protected] or calling 303.843.0370. Please consider using your checking account for your donation. The processing fee we pay is less so more of your donation goes to the ministry! You will receive an email receipt for your gift shortly after you click the submit button. If you would like a paper receipt mailed to you, please email [email protected] or call 303.843.0370. If you would like to designate your donation toward a specific ministry or team member, please include a note with instructions in the envelope with your check. You will receive a donation receipt in the mail. Youth For Christ is a registered 501(c)3 non-profit organization, and your gift is tax deductible. We thank God for your partnership! 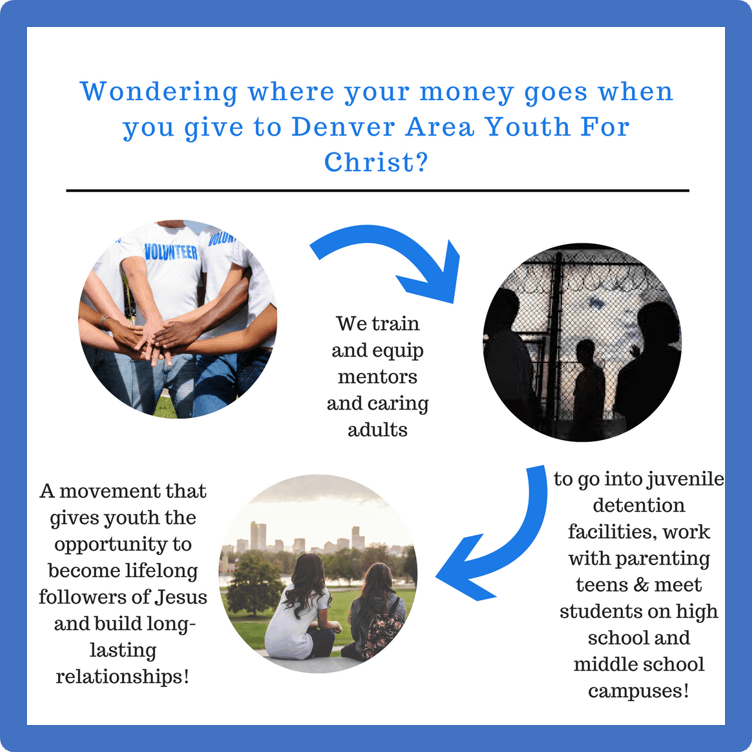 Your donation to the ministry of YFC in Denver enables us to reach thousands of lost and broken young people on High School and Middle School campuses, in Juvenile Institutions, Teen Parent groups and neighborhoods, all over the Denver area, with the life-changing message of Jesus Christ! Does your employer match gifts? Contact your Human Resources Department! Some employers will match all or a portion of your charitable donations. Log in to the donor portal to manage your recurring donations and view on-line giving history. You can update your address and information via this portal. Please note, since this is a new system for Youth For Christ, it will only show historical giving as of July 1, 2016. It will also only display donations made on-line. Give to our general budget or scroll down to support a specific ministry site or staff.